ALL HOMES PRICED UNDER $399,900! If you are looking for an affordable Burnaby condo, look no further than PIXEL by THIND Properties. Centrally located between Metrotown and Edmonds, Pixel Burnaby condos is your opportunity to live, play and invest in a growing neighbourhood that is quickly becoming the place to be in the city. Have it all with a home under $399,900! The presales launch will be in Spring 2016 and the project will consist of a 4 storey, low rise boutique condominium project located on Kingsway and Gilley. According to the marketing web site, the PIXEL Burnaby condos will be ideally positioned to take advantage of all the Metrotown amenities without getting caught in the Metrotown traffic. It’s expected to introduce 101 new condos to the area. For more information, please visit www.pixelburnaby.com or register on this page for further details as the launch date approaches! Buy or invest in an affordable Burnaby condo at PIXEL by THIND Properties today! The PIXEL advertisement in the New Home Buyers Guide presents a well designed 2 bedroom plus bonus guest room/den and two bathroom floorplan with 739 square feet in living space. The master bedroom includes a large walk in closet and ensuite with large shower. The U shaped kitchen is both functional and modern and the living room opens onto outdoor living space. The second bathroom located between the bedroom and bonus guest room/den has a tub/shower and single vanity. Hot off the press: The new Pixel condos near Metrotown is a new project by THIND Properties (well respected and experienced in the local market) and it features a great location, modern interiors and eye catching/unique architecture. With 101 homes coming soon to the Royal Oak Burnaby real estate district, the Pixel by THIND condos is an intriguing combination of glass, metallic accents and rippled HardiPlank siding. It’s cool, edgy and clearly distinct from other projects around the area, making it exceptionally unique and never to be repeated. The architecture is by Wilson Cheng Architects. From a distance, it actually looks like the building is pixelated. It’s innovative and provides smartly designed living spaces for residents. 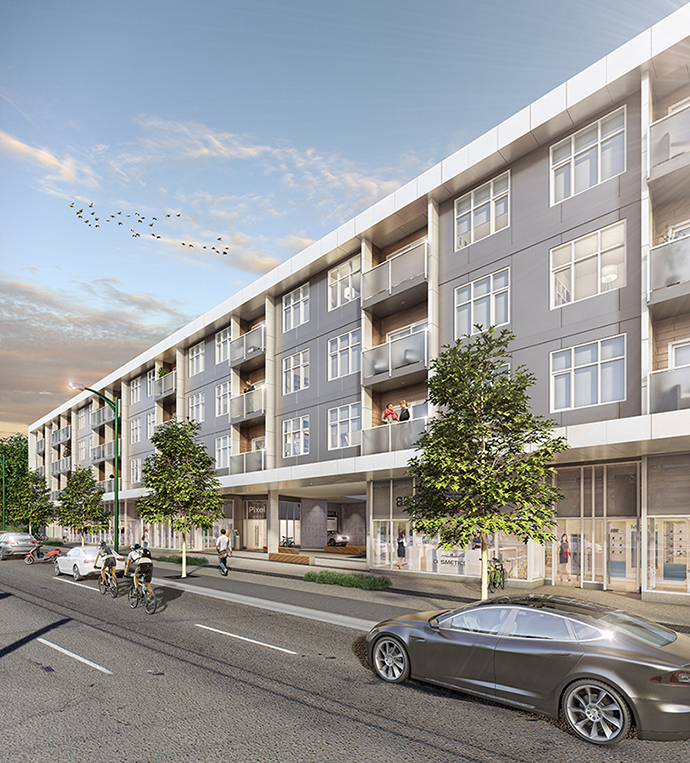 Located within the ‘Kingsway Corridor’ on Kingsway and Gilley, Pixel Burnaby Royal Oak condos for sale is all about central/walkable urban living but it’s also tucked into a quiet residential area unlike its neighbouring communities of Metrotown and Edmonds. It’s a short walk away from the SkyTrain Line and it’s also equal distance between Highgate Mall and Metrotown. From unique one-off boutique retail stores to an incredible array of international cuisine (both casual and formal), the Royal Oak Burnaby Pixel condos for sale is all about convenience, but at the fraction of the price. From the nearby Bonsor Recreation Centre (amenities that include a drop in gym, racquet sports, yoga) as well as the Highland Trail (great for cycling and walking), there’s plenty of recreational outdoors activities to pursue around you. In addition, the Pixel Royal Oak condos are within a three kilometre radius of 6 major parks and green spaces for you to explore, relax and entertain. Deer Lake Park and Central Park are amongst those within close walking distance from your front door. The Kingsway Corridor is fast emerging as one of the most forward and dynamic areas in the city. 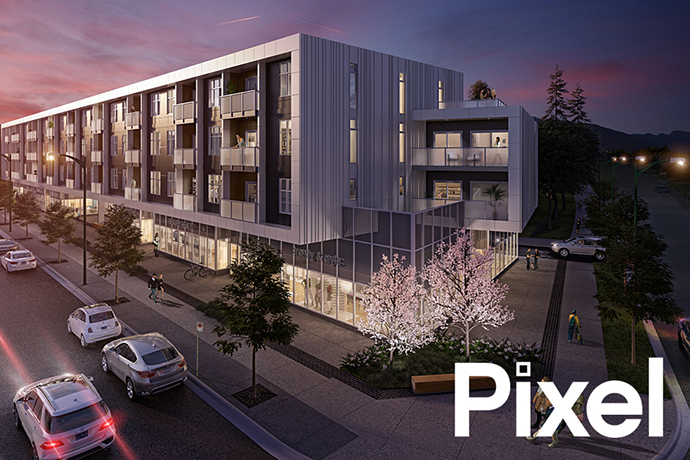 The affordable, family friendly homes at Pixel Burnaby is all about flexibility and affordability within a walkable neighbourhood. 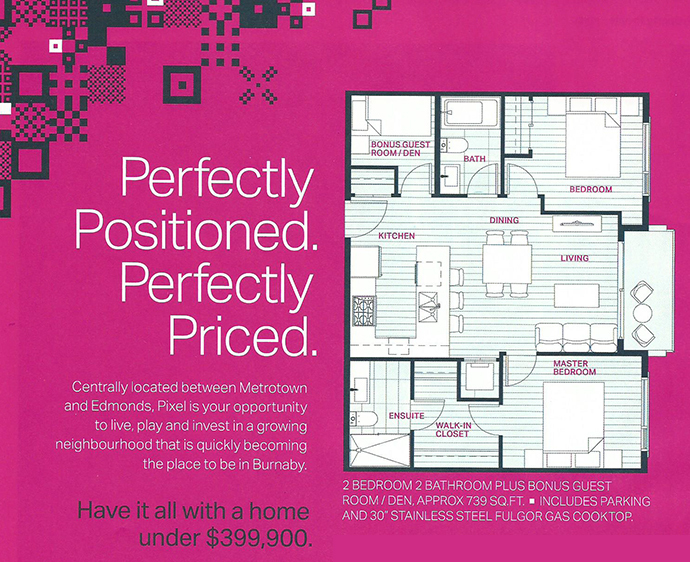 From 1 to 2 bedroom homes, Pixel by THIND has incredibly priced all homes under $399,900! And at today’s low interest rates, this is an exceptional opportunity. Not much has been released in regards to the level of finishes and features for these new Royal Oak Burnaby homes. But knowing past successes by THIND Properties, they will be on the higher-end. Interior design colour palettes are carefully selected by award winning Port + Quarter. Other features for the new Burnaby Pixel condos includes European style kitchens featuring plenty of storage space including a flip up appliance garage to keep your gadgets and gizmos tucked out of sight, retro chic penny round glass backsplashes for a modern look and stainless steel appliances by Blomberg and Fulgor. There’s also the convenience of a recycling centre. The bathrooms will have stone counters and the large oversized windows will have roller blinds for extra privacy. The Pixel Burnaby condos also feature USB plug ins for your tech gear, wide plank laminate floors in the living spaces and balconies. From the affordability to the modern interiors and from the central location to its respected builder, PIXEL Burnaby condos are an exciting opportunity for first time home buyers to investors alike. The sales centre will be launching in Spring 2016.